Hyosung motors are made in Korea but ridden by the world as per their promise. 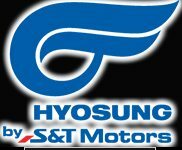 It is a part of the larger groups of S7T Motors Ltd of Korea. Established in 2005 its primary job is to produce world class bikes. Presided by Tony Kim, this USA headquarter bike manufacturer is a commitment provider for the bike lovers who are ready to buy by their promise. It has penetrated the USA market. It is worth it as it offers two years warranty instead of one year as per industry standards. The best known of their bikes include the 250cc, 650cc & 700cc in the cruiser category. They are affordable, come with brilliant after care and servicing. The most popular cheap models include the GT650 and the GT650R n the sports bike category. The bike manufacturer has warehouses in different countries and is doing very well in South America. Just this year in January it has launched the Aquila Pro and the New GT650R in India that is soon emerging to be a strong sales country for the bike manufacturer. They are also thinking of riding the Indian roads with commuter bikes.